Going into the trip, I didn’t really know what to expect, since I had never been to a convention like this before. I knew I was going to sit in a few lectures, get a handful of free pencils and brochures, and maybe buy a shirt or two. I never expected to have such an enlightening and eye-opening experience. I’ve been pretty much set on going to graduate school after I finish my undergrad, and (hopefully) get a teaching position at a community college. Lately, though, I’ve been second guessing my plans, and after coming back from JMM, I can’t really say that my plans became any clearer. 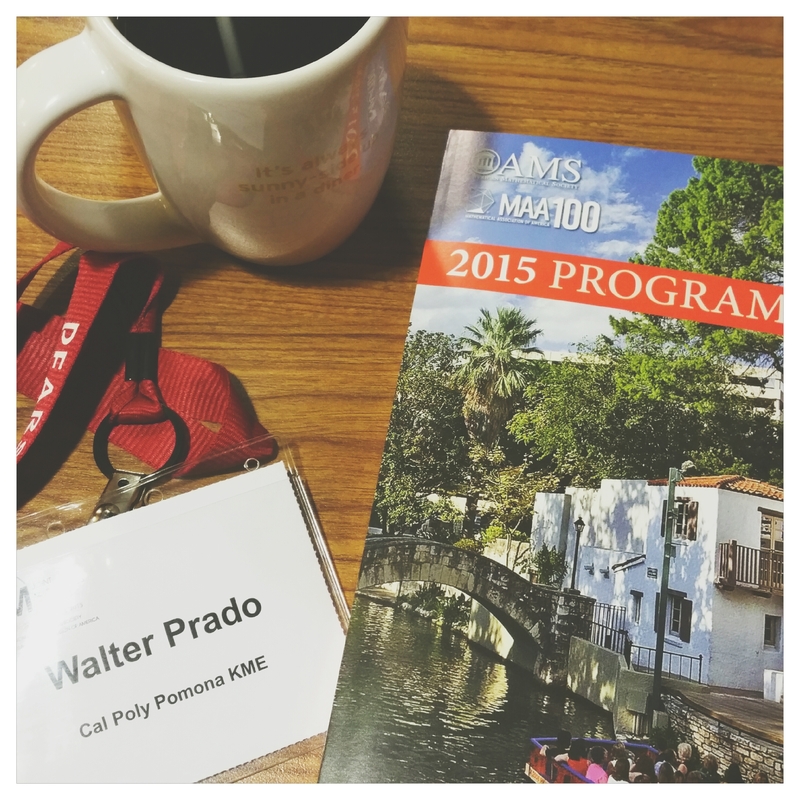 The JMM 2015 Program and my name badge. I’m not complaining though, because I can’t be anything less than grateful about the fact that I at least have options, and I soon realized this after I attended the conference. Had I not, I would have been completely lost, or I would have gone into a profession that I would have been miserable doing, something that happens far too often. Doors were opened for me, providing so many paths that I could take once I finished my degree, paths that I didn’t even know existed, or paths that I never really considered taking before. One option that excited me the most was the possibility of writing for a Mathematics Journal. I attended a workshop about the process of getting published without the strain of going into research (something I have no desire whatsoever to go into, hence my choosing a profession in teaching). Among the panel were four people who all worked for different Mathematical Journals, none of which were researchers or industry employees. Articles that are published in those journals range in content, from the application of Mathematics into the spread of disease, to Mathematics-infused fiction and poetry. I don’t consider myself to be the best writer (I’m a Science major, remember? ), but I do like to think of myself as a creative person. 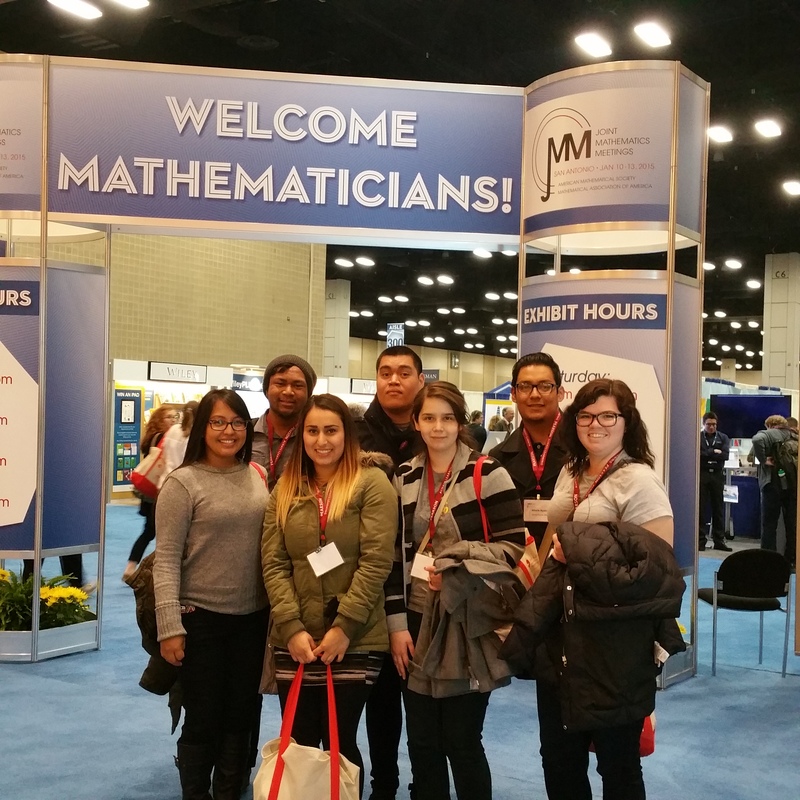 I am also highly fascinated with the application of Mathematics into other disciplines, as well as Math itself. So how magnificent would it be to take two of my greatest passions and integrate them in my career? Another option that I never really considered was becoming an Actuary. I had initially pushed the idea out of my mind, mostly because of the strenuous process it takes to become a classified Actuary. To land an entry position, two exams are required, both of which are extremely expensive and extremely difficult to pass. I never really had a flair for Statistics, but sitting in my Statistics class this past week, I not only realized that I understood it, but also felt myself taking a liking to it. So maybe my initial decision to completely ignore the possibility of becoming an actuary was a little premature. It also doesn’t hurt that starting salary for an entry level position can be as high as $60k a year. Overall, I had a pretty solid trip. I’m glad we weren’t confined to our hotel room and the convention center throughout the whole trip – our group was able to be tourists during our down time as well. We walked along the River Walk several times to get to various destinations, being able to appreciate the nature that surrounded the city, as well as the architecture of the buildings around us. We also ate at Lulu’s – a diner that was featured on several shows on the Food Network – and got their featured chicken fried steak (that was bigger than my face) and shared a 3-pound cinnamon roll (also bigger than my face). On the subject of food, we got authentic Texas barbecue on the River Walk. Finally, we visited the Alamo on our last day in San Antonio. Next year, JMM will be held in Seattle, and if the stars align properly, I’ll most likely be attending the conference again.